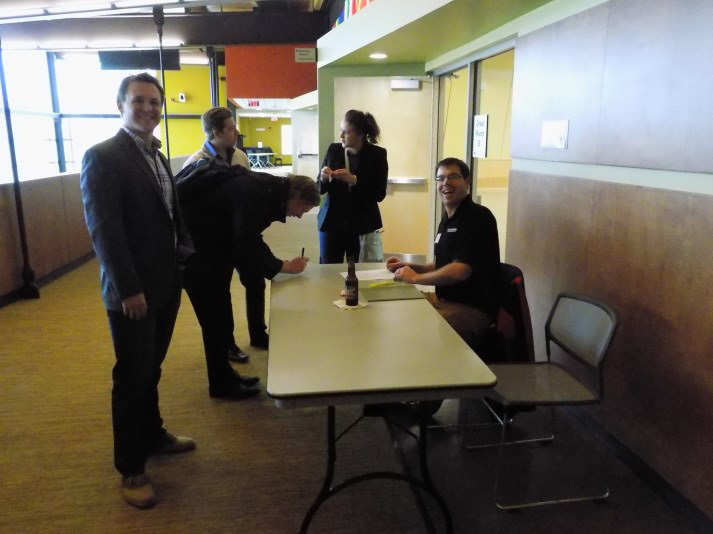 The DSTA had the opportunity to showcase many local programs, associations, and organizations at its April Meeting, held on the campus of the University of Wis-consin-Superior (UWS), in the Yellow Jacket Union. In conjunction with the faculty and students of the UWS Transportation and Logistics Management (T&L) Program, the DSTA was first treated to a T&L Program update from Assistant Professor Daniel Rust. Rust is new to the UWS program but is no stranger to the transportation industry as he created a Transportation Program at the University of Missouri St. Louis earlier in his career. Rust presented the benefits of the T&L Pro-gram at UWS, especially with the proximity to our Twin Ports. Segueing perfectly from education into business, Daniel proudly introduced Kate Ferguson from Duluth Cargo Connect (DCC). DCC is a newly formed Multi-modal Cargo Hub now operating on Duluth’s Rice’s Point. Ferguson is a graduate of the UWS T&L Program and is now a Business Development leader for DCC after previously working 9 years with Canadian National RR. Kate was very energetic about the business growth and stated that the DCC offers unique solutions to cus-tomers’ freight needs. She was quick to point out that DCC directly accesses four Class 1 Railroads as well as state of the art warehousing facilities, and of course the Port. Marta Larson & John Bergstrom, students in the T&L Program, next explained the happenings of the T&L Club. The T&L Club, operated by stu-dents, strives to heighten learning in transporta-tion education using real world, inevitable on the job examples. The club meets monthly and typically invites out-side industry leaders to speak to the group. They travel all over the U.S. gaining industry knowledge and competing against peers. T&L Student, Jacob Irlbeck, next presented his team project that won a competition at the latest Intermodal Association of North America (IANA) Conference in Houston, TX. The project revolved around backing solutions for a maritime company facing industry overcapacity issues. Jacob said that math was very necessary for the competition but also stated that the core of the competition victory was critical thinking using industry knowledge, something the T&L Program prides itself on teaching. Finally, the DSTA had its turn to present work they’ve been preparing. DSTA President, Leyla Aktekin, was pleased to announce the DSTA’s efforts in forming a financial educational scholar-ship directed towards students in transportation program degrees. The DSTA Board of Directors is using a subcommittee to develop the still very ear-ly stages of a scholarship. More info on the scholarship soon. See you all in May!